regardless of how successful your initial campaign may have been. In this next stage, you need to retain the interest of both new and existing clients. In the following booklet, we have outlined some of the best practices for any organisation, to ensure their follow-up campaign is a success. e-mail communication templates for each potential contact with which you may engage at the event. Following an event, your follow-up should be prompt. We recommend touching base with newly-established contacts from the event within 1-3 working days. From our experience, the first three days following a networking event convey professionalism and sincerity. Ensure data is quickly dealt with. We recommend engaging with existing contacts first, as these contacts require less information about your company or brand than newly-networked contacts. content that will invite clients and new partners to your brand and inform them of what you and your brand are about. So, even with a general “thank you for joining us” e-mail following an event or exhibition, it is important that they generate the right first impression and inform them of ways in which your company can benefit them. Promotional products may also be used, but try to think outside of the usual pen or mouse mat, depending on where you exhibited and the audience you’re trying to appeal to, so depends on the promotional merchandise. Photography is reusable and reinforces your brand, clients and partners may reuse this on their own channels. It is also a great idea to include your photography in your thank-you e-mails, it invites the client into your brand. 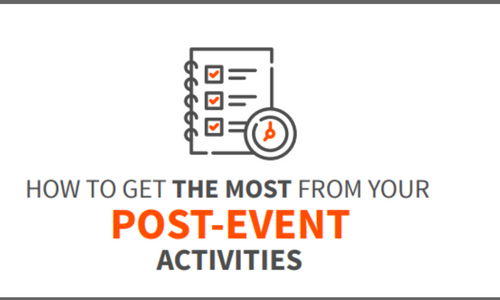 Our hope is that these best practices for post-event follow-up help you to make the most from your sales and marketing efforts, so you can maximise your event ROI, and establish your brand’s professionalism and differential. Good luck. If there is anything we can help you with you before your next event, or this campaign follow up then please do contact us.